Earthquakes make waves. That's a trivial, commonplace statement, given the fact that seismic waves can violently shake the ground and topple buildings. But there is another kind of wave generated by temblors, which can only be seen after heavy numerical manipulation of the data from certain types of satellites. Here is how it works: About a half dozen of the satellites currently circling the earth continuously send out radar beams to probe the Earth's surface. They have a separate sensor on board which registers the radar beam's reflection off the ground. The primary mission of these "Synthetic Aperture Radars" (SAR) is to exactly map the altitude of the surface with a precision of one half inch or less. To the delight of earth scientists, the radar sensors have an additional benefit. Every few weeks, the satellite path repeats. That means it passes over the same regions of the Earth in the same order. It is then possible to detect slight changes in the elevation of the Earth's surface which have occurred from one fly-over to the next. 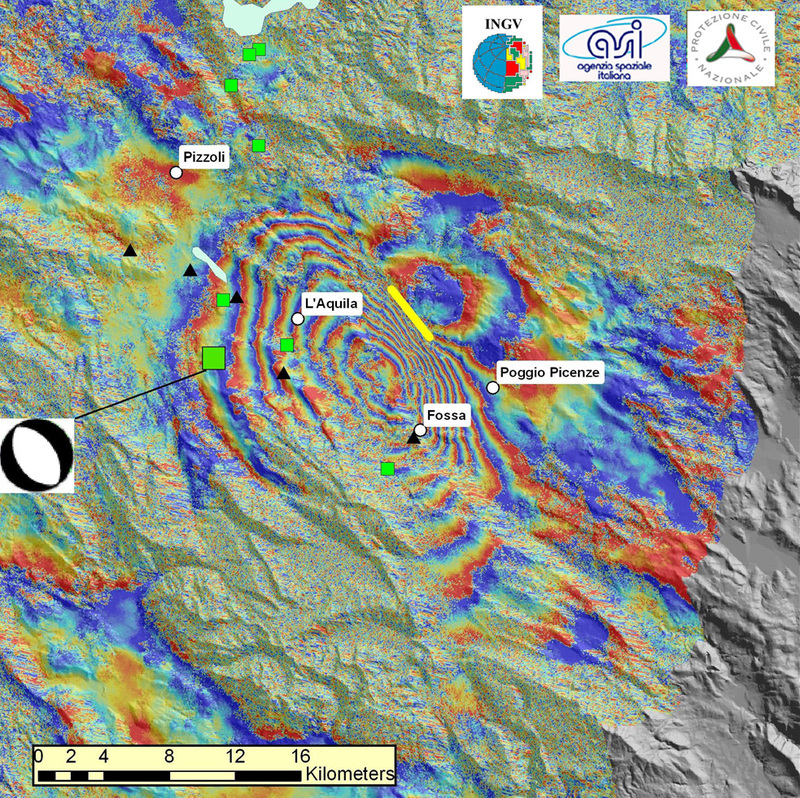 Let's apply this to seismology: The European satellite "Envisat," which carries a SAR sensor, flew over the Abruzzo region of Central Italy on February 1, 2009 and then again six weeks later on April 12. In the mean time, a devastating earthquake occurred near the town of L'Aquila, killing more than 260 people (see blog April 6, 2009). Italian scientists compared the radar pictures taken during the two successive orbits using a numerical technique called "Interferometry," essentially subtracting one picture from the other. 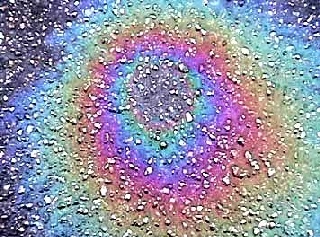 The result is a map of colored waves, similar to the iridescent patterns one can see on a soap bubble or when an oil film covers a puddle (see Fig 1). Just as a physicist can use these color patterns to determine the thickness of the oil film or the bubble walls, Earth scientists can interpret the maps. Each colored ring is a measure of how much the ground has moved as a result of the earthquake. In this case, each ring represents a movement of just over an inch.